currently under construction at Cypress. Sales for available units range in price from $265,000 to $429,990. Fair Meadows unit sizes range from 2227 to 3168 square feet. Fair Meadows has a total of 3 quick move-in homes currently for sale. A small, cozy community set among farms and livestock, yet just a 30-minute drive to downtown Houston, is what you’ll find when you step foot into Fair Meadows. Located in Cypress, an extraordinary town where everybody knows each other, this amazing community is the perfect fit for both growing and established families. Discover beautiful homes with intricate details, top-quality materials, and oversized yards for outdoor activities. You’ll choose from a variety of plans from 2,100 square feet to over 3,500 square feet. There’s no better place to be! And so many exciting things are waiting for you outside of the Fair Meadow neighborhood, too. Outlet and antique shopping, dining, golf courses, great Cy-Fair ISD schools – all of this is just a short drive away. Want even more? Upscale restaurants, sporting events, and local attractions can be found in downtown Houston. Take a deeper dive into the Fair Meadows community – you’ll be glad you did! Young residents will attend Ault Elementary School, Salyards Middle School and newly opened Bridgeland High School. 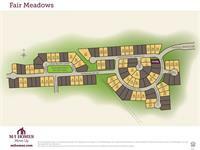 Your inquiry will be delivered to the Fair Meadows sales team, who will send you more information about this development.